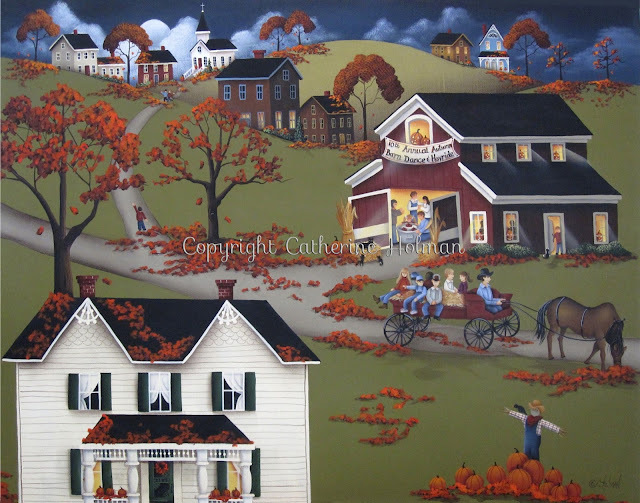 This painting, Annual Autumn Barn Dance & Hayride, is one of my most looked at prints on FineArt America. I do, however, need a better image of this particular piece so that I can sell larger prints. Back in the day when I first started selling my artwork on eBay, I never stopped to think about reproducing them for prints before the paintings were sold. I may just have to paint this one again. I will probably make a few changes here and there to make it new and fresh though. I also have a new Halloween painting to share that I finished last year and have been hanging onto it. Not quite yet, but a painting of yours comes to mind. It would be a great place to start. I have done a few things to get ready for my favorite season. This painting is absolutely delightful!